It’s a disarmingly simple, yet almost superhuman task: Run for 24 hours. Run more miles than anyone else, and you win the race. Two local runners, who are among the best in the world at doing just that, are heading to Torino, Italy, next week to represent the United States in the 24-Hour World Championship. “There is no greater honor than running as a representative of your country,” said Traci Falbo, 43, a pediatric nurse who lives in Charlestown, Indiana, about 100 miles downriver from Covington. 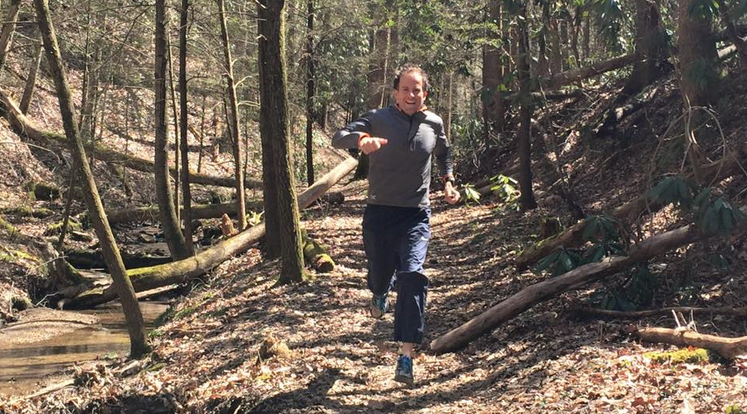 Also returning to the team is Harvey Lewis, a Cincinnati school teacher who runs with and coaches for Tri State Running Company in Edgewood. The event is set for April 11 – 12. The race has separate categories for men and women. Each country can run up to six men and six women; the miles of the top three men and top three women on each team are added for an overall team winner in each category. Gold, silver and bronze medals also are given to the top three women and the top three men. A 24-hour race is run on a track, generally of less than a mile, and the runners go around and around the path, stopping or slowing down whenever they want, whether to eat, drink, or use a restroom. At this level, few runners actually stop for any length of time. Competition for a spot on the team is determined in a series of sanctioned 24-hour races held in the year before the World Championships. It’s not easy. To qualify, a woman must run at least 120 miles in such a race; a man must run 135 miles. Falbo and Lewis both qualified at two separate events. Falbo, who often runs the trails and road races in Louisville, had the second best qualifying miles among women. Lewis, 38, had the best mileage among men. Falbo’s best mileage was 147.676. 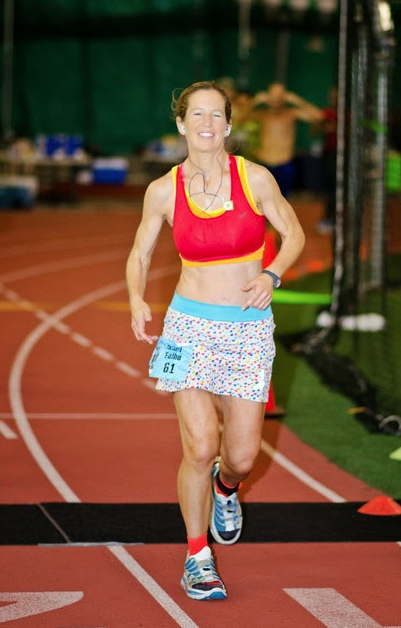 Her second best, which was 135.182 miles, occurred during a 48-hour race in something called Six Days in the Dome, held annually in Anchorage, Alaska. And yes, in addition to 24- and 48-hour races, that event also has a six-day race. Last year, a Georgia fellow won that by running 580.3 miles. Lewis qualified by running 154.59 miles at a 24-hour race in Spartanburg, South Carolina. His closest competitor, Isaiah Janzen of Dubuque, Iowa, ran 154.587 miles at the North Coast 24-hour race in Cleveland in September. Over 24 hours, that’s a difference of less than 16 feet. Some 10 years ago, Falbo lost 80 pounds and decided to run her first marathon. She hasn’t stopped. Since then, she has run a sub-four-hour marathon in all 50 states, winning 19 of them. She’s completed the Grand Slam of Ultrarunning — becoming one of only 39 women in 28 years to run four specific 100-miles races in a year. 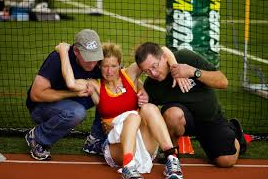 She’s broken the 15-hour mark in a 100-mile race. And she holds the world indoor record and the American overall record for miles in a 48-hour race, running 242.093 miles in the Six Days in the Dome race. For the World Championships, she’s training in much the same way she does for a 100-mile race, generally running 90-odd miles a week, sometimes doing half of that or more on back-to-back days. When she was on the 2013 team, she finished fourth among women, and third on the U.S. team, helping it win a gold medal. This year, her goal is to do even better. “I would like to break 150 miles, get on the podium individually, and score for the U.S. team,” she said. Lewis has similarly high goals. That belief has carried him far. He won the 135-mile Badwater Ultra-marathon through the deserts of California in July 2014, then followed that up with a shared second place in the 135-mile Arrowhead Ultra-marathon in Minnesota in January. Earlier this month, he ran 54 miles to retrace the Selma-to-Montgomery civil rights march on its 50th anniversary. 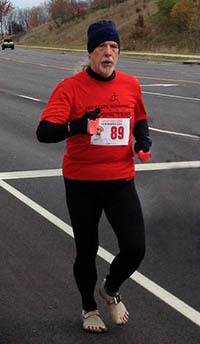 He paced the two-hour group at the Run The Bluegrass half marathon this past Saturday in Lexington. He finished a mere 26 seconds off his pace. Ultra-marathons through deserts and wilderness have their place in his heart. But Lewis also enjoys the repetitiveness of a 24-hour race.